President Trump and first lady Melania join three U.S. nationals as they step out of plane early Thursday morning at Joint Base Andrews. President Trump and first lady Melania joined three U.S. nationals as they stepped out of a plane early Thursday morning at Joint Base Andrews, a day after their release from detention in North Korea. U.S. Secretary of State Mike Pompeo arrived in North Korea yesterday to finalize details of an upcoming historic summit between President Donald Trump and North Korean leader Kim Jong Un. Pompeo pressed for the release of the three detained American citizens, whose release Trump has been hinting at. His trip came just days after North Korea expressed displeasure with Washington for comments suggesting that massive U.S. pressure had pushed Kim to the negotiating table. Although there were no guarantees the American prisoners would be freed as a result of Pompeo's visit, U.S. officials said on Tuesday their release would be a significant goodwill gesture ahead of the Trump-Kim summit expected later this month or in early June. 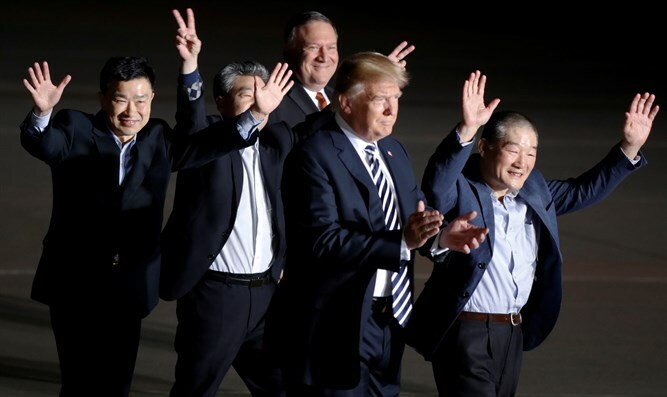 "I think it would be a great gesture if they would agree to do so," Pompeo said, according to AP, adding that it would be difficult to hold a leaders' summit if the prisoners remained captive. The three Korean-Americans - Kim Dong Chul, Kim Hak Song, and Tony Kim - were all accused by North Korea of anti-state activities.